MORNING MEDITATION: Well, I’ve upped it to 15 minutes. An eternity, for someone who was not really even finding time to sit still. But, then again, no, it’s not an eternity. It feels good. The guiding is dwindling away, and there are longer expanses of “being there” alone. But I need that. It helps. I don’t know how or why it works, but it does. Long after it’s over, it’s still helping. I’m thinking I’ll try it on the plane when I fly home in a couple weeks. I loathe flying. MORNING MEDITATION: Today’s went well. In fact, I did two. First, my usual 10 minutes of sitting in “silence.” And then, my first walking meditation. I walk all the time so adding a layer of awareness was a beautiful thing. Turned it into something more amusing and cinematic. Had to double up, because the weekend was an awareness wasteland and my brain craved escaping to its wide, open space. I was instantly hooked on the soundness of that advice and the poetic texture of the word “dither” (zither, feather, whither). I have tended, in years past, to do both—hurrying to meet those incessant and heartless personal and professional deadlines, and dithering to give myself a break. The thought of moving purposefully forward, in working or walking, appeals to me. Without a racing mind and a racing heart, but with faith that the pace is fine for getting wherever it is I am going. Walking this morning, feeling my feet roll into the pavement and back out of it, I felt connected to everyone else who was walking. Our rhythms merged in the chiaroscuro landscape of bright, early sun. MORNING MEDITATION: 10 minutes. Went well considering I got hung up on one of the first things the guide suggested in his beguiling, mellifluous tone: “Try to note the flavor of the mind.” The beauty of that phrase—the beauty of that idea—colored the rest of my meditation. Of course he’s talking about mood, underlying emotion. But how juicy and delightful is the concept of the “flavor of the mind”? TLC: Abandoned in the kitchen, a pink elephant eraser of my 13-year old daughter. A wise-eyed rubber pachyderm whose sole existence is to whisk away her small, here-and-there errors. And where was he left? Under a vase of ranunculus given to me by my husband to lift my spirits (tough day at work). Ranunculus which happen to be the exact, un-Photoshopped, pink of Aforementioned Elephant. Touchstones. Reminders. I cannot look at these without feeling great happiness and gratitude. The desire to laugh. The flavor of the mind? You guessed it. Bubblegum pink. MORNING MEDITATION: Yesterday’s was nonexistent and today’s was the work of a tired mind. I’d have preferred sleeping. Am I the only person who finds weekends and holidays more exhausting than the M-F/9-5? Today’s Daily Cure was one of those cinematic moments that stops time. I was walking with my daughter in Via Dante by a café, when we spotted a woman rigorously dressed and turbaned in white with a foam-topped coffee in front of her. She sat very still, observing other women as I was observing her. A video of yet another woman played in the window across the street. I felt bound to them all in that instant. Nothing to do with Deviled Eggs, but such is the unpredictability and randomness of what makes us happy. I hope your weekend is full of such moments. MORNING MEDITATION: 10 minutes. Went well. Body felt more relaxed than usual. Less tension between the shoulders. Slight interruption as my husband left the house: Would we eat octopus for dinner? Who would pick it up? Who would prepare it? That settled, I dropped back into the warm blackness of my inner space. Thoughts a bit flighty at first, then calm. TDC: The feel of my feet on the ground as I left the dentist’s office in an almost celebratory frame of mind. (A good dental cleaning always boosts my spirits.) The realization that—no matter where we are—we are walking over history. Layers and layers of it. Millenia of it. 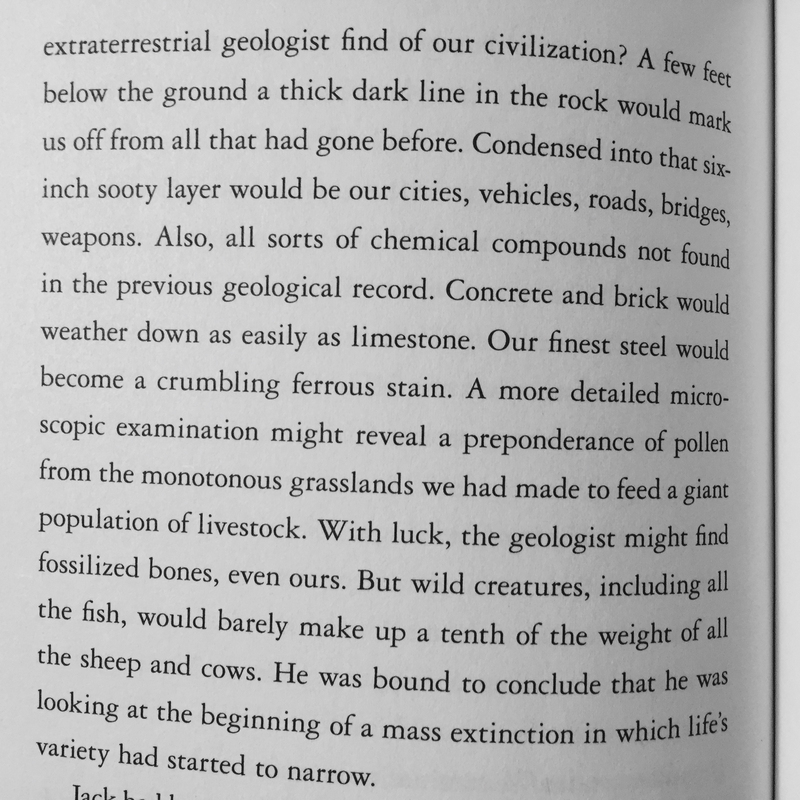 The thought that if all our personal, daily trajectories and wanderings dragged faint threads behind them there would be an infinitely intricate mesh laid across the surface of the earth that would then fall down into the layers of geological time*. I saw a nun crossing the piazza, pleading with someone on her cellphone, moving urgently in a straight line toward, and then through, the center a masonry X. *These thoughts were probably influenced by a passage I recently read in Ian McEwan’s beautiful book The Children Act. You can read it here. DAY: Thursday, even though I woke up feeling—think Bill Murray in Ground Hog’s Day—that it was Wednesday all over again and that it would be kinda nice if it were, in fact, Saturday. TDC: There was a bonus Daily Cure yesterday. It was Women’s Day which is typically celebrated in Italy with the gift of Mimosa flowers. A little French café I like for afternoon pick-me-ups was giving its female customers tiny, silver-dollar-sized tartes au citron, having given themselves creative license to interpret the yellow of mimosa with the yellow of lemon. It was delicious, intense and totally unexpected. I felt appreciated as I nibbled it into nonexistence. How does that get to be today’s post? Because the goodness of that kind of gesture lingers.